On August 2, 2018, State Councilor and Foreign Minister Wang Yi attended the China- Association of Southeast Asian Nations (ASEAN) Foreign Ministers’ Meeting held in Singapore. Wang Yi expressed that since the establishment of the China-ASEAN strategic partnership 15 years ago, bilateral relations have enjoyed constant development, realized a transition from quantity accumulation to quality leap, and marched from a growth period of rapid development towards a maturity period of improvement and upgrade, entering a new stage of all-round development. This year marks the 40th anniversary of China’s reform and opening up and the beginning of the second fifty years of the ASEAN. On the occasion of the important moment of China-ASEAN relations inheriting the past and ushering the future, China will continue to regard the ASEAN as a priority in its neighboring diplomacy, adhere to good-neighborliness and friendliness, uphold mutual benefit and win-win results, support the building of the ASEAN community, and support the central position of the ASEAN. China stands ready to, together with the ASEAN, jointly share opportunities, face challenges, and build a closer community of shared future, making China-ASEAN cooperation a pillar of regional peace, stability, development and prosperity. Wang Yi noted that the development of China-ASEAN relations should be guided by strategic alignment. The Chinese side suggests that under the guidance of China-ASEAN Strategic Partnership Vision 2030, both sides should enhance alignment of development planning of the ASEAN countries, the ASEAN Community Vision 2025, and the Belt and Road Initiative to complement each other’s strengths and tap into cooperation potential to open up greater cooperation space. Both sides should strengthen security cooperation, and increase strategic mutual trust. The ASEAN countries are welcome to actively participate in joint maritime drills held by China and the ASEAN this October, reinforce anti-terrorism cooperation among defense ministries, and conduct more cooperation in such areas as disaster prevention and reduction, humanitarian aid and military medicine. Both sides should further deepen cooperation in economy and trade as well as investment, promote the protocol on upgrading the China-ASEAN Free Trade Area to take full effect, boost trade liberalization and economic globalization and expand exchanges in such fields as education, tourism, media and youth. The Chinese side proposes to set the year 2019 as the China-ASEAN Year of Media Exchanges. It is hoped that the two sides will take the China-ASEAN Year of Innovation as an opportunity to deepen cooperation in such fields as smart city, digital economy, artificial intelligence, and Internet Plus. The Chinese side is willing to jointly build the economic development belt along the Lancang-Mekong River basin with countries along the Mekong River to elevate the level of cooperation with the East ASEAN Growth Area. 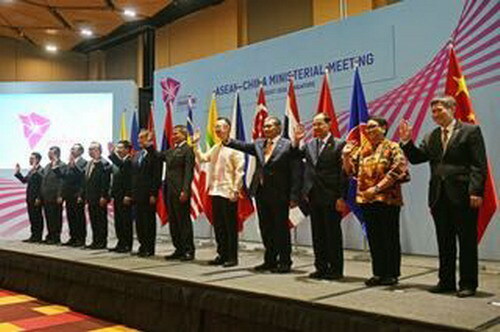 Foreign Ministers of the ASEAN countries expressed gratitude in their speeches for China to support the building of the ASEAN community and the central position of the ASEAN in regional cooperation, and fully recognized the major and positive progress achieved in the development of ASEAN-China relations. They believed that China is a cooperation partner of the ASEAN which delivers the most tangible and effective results, and that the Belt and Road Initiative has provided major opportunities for the region to realize connectivity and common development. It is expected that both sides will further enhance alignment of development strategies, and deepen exchanges and cooperation in such fields as economy and trade, innovation, connectivity and tourism. Foreign Ministers all agreed that facing the current severe situation of rising protectionism, China and the ASEAN should reach the Regional Comprehensive Economic Partnership agreement at an early date, firmly committee to trade liberalization and the process of regional economic integration, and safeguard multilateralism and the rules-based multilateral trading system. Foreign Ministers all welcomed that China and the ASEAN countries have agreed on a single draft negotiating text of the Code of Conduct (COC) in the South China Sea. They hoped that both sides could continue to promote the COC negotiation to jointly maintain regional peace and stability and boost regional development and prosperity.